Juicing allows you to boost levels of minerals and vitamins in your body because of all the healthy ingredients you include in your juice. You can even raise your calcium levels without having to reach for a carton of milk. Most Americans don’t get enough calcium per day, but it’s not just a dairy by-product. There is probably a handful of calcium containing fruits and veggies in your kitchen right now. The reason calcium is so important for your overall health is because it supports healthy teeth and bones. Your teeth and bones are a mixture of calcium, collagen, and to keep them strong, you must up your calcium intake. Your bones are made up of calcium and are made stronger because of it. But they’re also a storehouse for calcium. Did you know that 99% of the calcium in your body is in your bones and teeth? The other 1% is in your blood. Calcium also aids in muscles movement and contributes to a healthy nervous system. Osteoporosis and brittle bones are what you have to look forward to when you don’t get enough calcium, which is especially important for postmenopausal women who are already at a higher risk of bone loss. Adults should consume at least 1,000 mg of calcium per day, which might sound tough. It’s actually difficult to get this much calcium from the typical fruits and berries you’d use for juicing. In fact, you should focus on the calcium-rich vegetables to make your calcium-boost juice, instead of taking them in supplements form. One of the best natural foods with a ton of calcium is kale. Sure you could reach for yogurt and cheese, but good luck juicing them. Raw kale has 100mg of calcium per cup, and raw bok choy has 74 mg of calcium per cup. 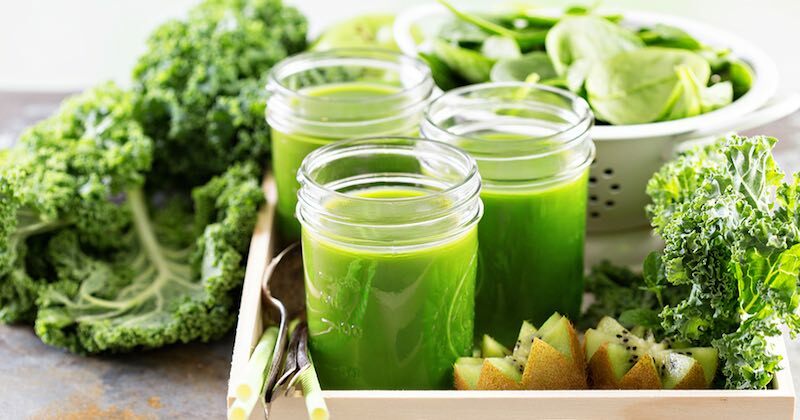 A cup of raw broccoli has 42 mg of calcium, but this does not sound like a delicious juice just yet. Many fruits common in juicing recipes aren’t packed with calcium. For example, one medium-sized apple, contains just 11 mg of calcium. 2 tablespoons of currants have 47 mg of calcium. Currants, apricots, oranges, and blackberries are all flavorful fruits you can juice for their calcium benefits.